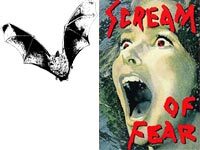 When many people think of bats an image of large blood sucking beasts appear, yet this image has no basis in reality and is mostly derived from old horror movies and folklore. These misunderstandings and folklore make them among the most feared animals in Minnesota. Bats are relentlessly persecuted wherever they are found. The presence of a bat in a house probably causes more alarm than does any other wildlife species. Bats will not fly into your hair. Bats are not blind. Bats are of benefit to humans. All bats carry rabies is just not true. In reality less than one percent of bats carry rabies, and fewer than ten people have contracted rabies from North American bats in over 50 years. Love them or not, bats are a very important part of our ecosystem. A single bat can eat up to 3,000 mosquitoes and other flying insects in one night and an average size colony can eat up to a half million insects every night! As marvelous and biologically diverse as they are, most people do not want bats actually living in their home, and it is important to remember there are effective ways to remove them that are both safe for your family as well as the bats. A number of methods have been tried to evict colonies of bats from buildings. Whether you do the work yourself, or call a Wild Animal Management Company, the ONLY CONSISTENTLY SUCCESSFUL METHOD IS PERMANENT PHYSICAL EXCLUSION. You want the bats out, not dead. To keep them out, all access must be blocked. This is a difficult, technical process because bats can use very small access holes, the size of a quarter. We want them in the environment, not in your home. Bat removal is not a simple task. It is often very challenging, and it must be done just the right way. 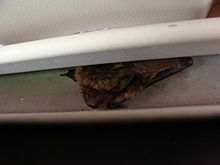 An amateur attempt could result in disaster – dead, rotting bats, and bats swarming throughout the walls and the home. There is no registered or effective bat repellent available. Some companies will try to sell anything – there are a lot of so-called bat-repellent or bat-away products on the market, but they are bogus. And those high-pitch noisemakers? The FTC has issued a warning against them – ultrasonic sound emitters do not work. There is no quick and easy fix when it comes to bat control. There are seasons to do an exclusion; in the spring after insects have appeared or in the fall after the babies have learned to fly. Timing is critical for excluding bats. In the spring and summer, if a maternity colony has taken up residence, you will need to delay excluding the bats when the young are able to fly. If you exclude the adult bats while the young are flightless, the young bats will needlessly starve to death and may create an odor and pest problem. Frantic mother bats, excluded from their young may mistakenly get into your living area when trying to find a way back to the roost to care for the pups. Exclusion should NOT be performed when young bats, incapable of flying, are present (typically May-July). This should not be done in the Spring because newborn bats will be trapped. Bat exclusions should be performed ONLY during the months of August and September! Whether or not you decide to delay excluding the bats for the above reasons, concentrate your efforts first on bat-proofing the living areas of your home. Make sure doors to attics and basements are sealed with draft guards and holes in any interior walls and ceilings are repaired so that a bat can’t mistakenly enter the main parts of your house. In attics and areas where large numbers of bats have been roosting for years, it is safer for you to hire a professional to do the work, including the cleanup of accumulated droppings, along with prevention services to keep bats out for good.